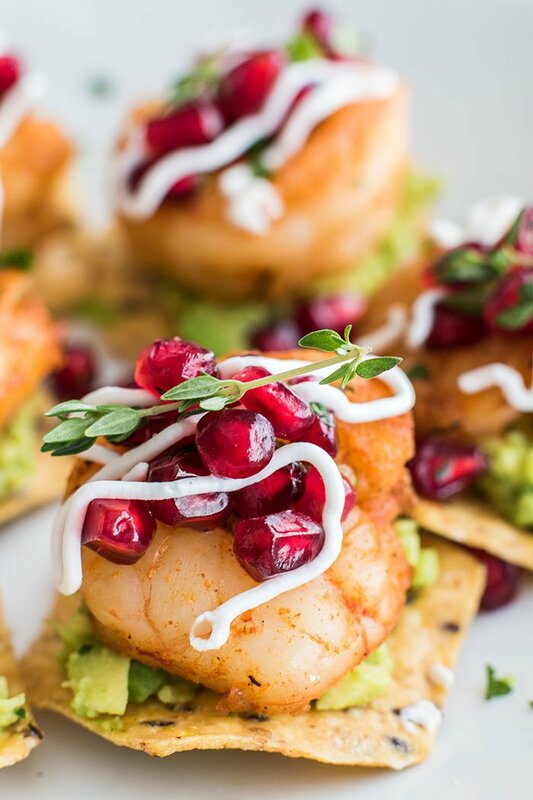 These beautiful mini tostadas are made with a multi grain tortilla chip, guacamole, and a festive pomegranate salsa. The recipe isn’t complete without a jumbo blackened shrimp! Serve right after assembling. If wanting to prepare ahead of time, it’s okay to prepare the blackened shrimp and refrigerate and use cold. If you’d like to serve them still warm, simple prepare the blackening seasoning and then cook the shrimp right before serving. The guacamole and pomegranate salsa can be made the day ahead. Squeeze extra lime juice on top of the guacamole and cover with a sheet of plastic wrap, pressing it into the guacamole to prevent browning.